The Relationships field allows you to create a relationship between one contact and another contact in VerticalChange through a form result. For example, if you are filling out a contact form for a client, and you would like to track who that client's child is, you can add a Relationship field to the client's contact form, type in the child's name, and select the correct child in VerticalChange from a dropdown box. The two contacts will then be connected and you can view their relationships from their Groups tab. You can also add Relationship fields to activity and assessment forms to track when a secondary contact has a relationship with your person or group contact through an activity or assessment. In another example, if you are recording evaluations on a classroom or site contact, you may want to connect to that form the teacher contact that was present during the evaluation. By adding a Relationship field to the assessment form, you can select the teacher that was present during the evaluation. 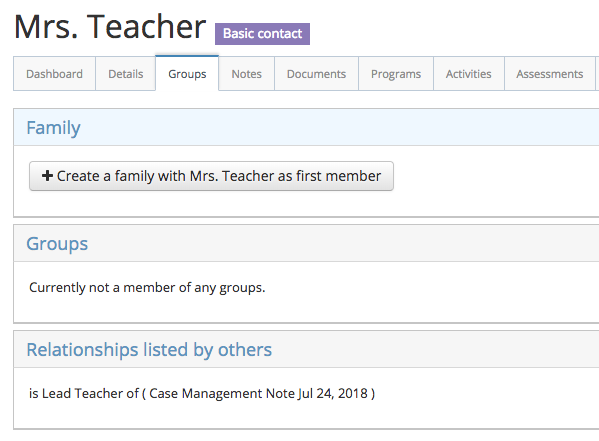 The teacher contact will then have a relationship with the site contact, listed on the teacher's Groups tab. To add the Relationships field to your form, simply click the Relationships button under Available Fields section, or click and drag it into the desired location in your form. When filling out a form for a contact or group with a Relationships field, it will appear as below. To connect a contact in the VerticalChange system, begin typing the name of the contact in the text box. A dropdown box will appear matching the contacts in your system with the name you have typed. You can hover over each contact to view additional information about them. If the contact is already in the system, click on the correct one and it will be added to the field. You can remove the contact from that field at any time by clicking the remove button. If you have typed in the name, and the contact is not yet in VerticalChange, you can select the create NEW contact called "Name" to add the contact to VerticalChange. The contact will be added to the field, and they will also be created as a Basic Contact, with no additional information. You can later search for this contact in the top Jump To contact search bar to fill out more information on them. When viewing form results or contact forms with Relationship fields, any contact that is linked through that field will be hyperlinked. Clicking on the contact's name will bring you to the contact's profile. You can then view the relationship information between the two contacts by visiting the linked contact's Groups tab and viewing the Relationships listed by others section.